If you’re looking for a highly resistant yet not-terrible-expensive full-face snorkel mask, look no further than the one made by Octobermoon. 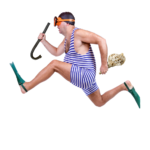 The fact is that not many snorkeling masks can compare to the Octobermoon in terms of quality and even fewer when it comes to its unique design. These are just two of these reasons that helped the Octobermoon become a favorite among amateur and professional snorkeling enthusiasts alike. It’s no surprise that this mask made it to our list of best full face snorkel masks, together with the WildHorn Seaview, the Ocean Reef Aria and the TriBord Easybreath models. This review will cover everything you need to know about this mask but first, let’s talk a bit about why you should use a full-face snorkel mask to begin with. In case you have a more urgent question, please refer to the table of content below, otherwise, stick with us throughout the whole review. What Makes the Octobermoon Mask So Special Compared to Others? 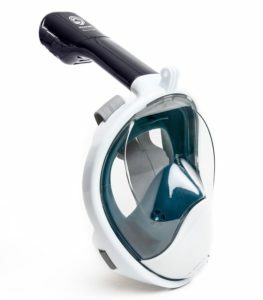 Should You Buy Octobermoon Full Face Snorkeling Mask? · Less fogging – Full-face snorkel masks come equipped with breather chambers that are separate from the rest of the mask. This allows the user to breathe freely without having to worry about fogging the lens. Some fogging may still occur but to a much lesser extent than with a regular mask. · Better field of vision – These types of masks are designed to offer a 180° field of vision, which leads to much better visibility underwater when compared to regular masks. · No gagging – Not having to worry about holding on to a mouthpiece all the time will allow you to breathe freely through your mouth and nose while underwater. · No jaw fatigue – Jaw fatigue might not become a problem during short diving sessions but you will definitely start to notice some fatigue if you stay submerged for longer periods of time. There’s no mouthpiece with a full-face mask and that means jaw fatigue will never become an issue. 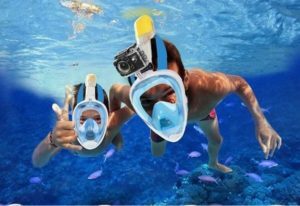 Full-face masks are also carefully designed to prevent water from entering the snorkel. This is achieved thanks to a very simple mechanism comprised of a float ball that stops the water from entering if the snorkel happens to get submerged. As an added precaution, the mask also comes equipped with a valve that drains the water once the snorkel is no longer submerged. Octobermoon immediately stands out from the crowd thanks to its futuristic design. The design is both visually appealing and practical so expect plenty of nice features. The mask never leaks thanks to its very robust construction, which also makes it shatterproof. Meanwhile, you’ll be hard-pressed to find a mask that offers a better field of vision than the Octobermoon. With this mask, you also don’t have to worry about any water getting in because the Octobermoon features a separate air flow chamber. The mask’s frame is built using highly durable polypropylene while the skirt uses high-quality silicone. Octobermoon is able to easily accommodate all types of faces thanks to the silicone so don’t worry about your face being too wide or too narrow for this mask. Octobermoon is a one-size-fits-all solution. The mask comes equipped with a flat lens built using shatterproof polycarbonate material. Unlike round lenses, the flat ones don’t distort the user’s field of view so expect to be able to enjoy all the beautiful underwater scenery while submerged. 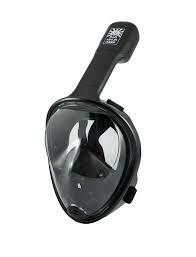 Much like the lens, the snorkel is also made of highly resistant polycarbonate material. The snorkel can also be detached for easy cleaning and features a Splash Guard that prevents water from entering the tube. A small valve can be found in the chin area and is there as an additional safety measure. If water manages to somehow reach the interior of the mask, this valve will allow it to quickly drain out once the wearer’s head emerges from the water. As an added benefit, you also won’t have to worry about draining the mask or snorkel yourself because the Octobermoon does all the work for you. Octobermoon’s airflow system incorporates a separate breathing chamber that allows the wearer to breathe through the mouth and noise without having to worry about fogging issues. As mentioned before, this mask does not get easily fogged and it’s all thanks to this special airflow system. Octobermoon’s weight is just over a pound, which makes it one of the lightest full-face snorkel masks currently available on the market. The mask comes with adjustable straps that are both soft and sturdy. The last thing you want while underwater is to feel any sort of pressure because of the straps so make sure to adjust them to your liking before jumping in. The Octobermoon is available in a wide range of colors. These include green, pink, black, blue, and blue kids. In addition, there’s also two-color variants like blue/white and pink/white. The mask comes in three sizes: XS, S – M, and L – XL. Don’t forget that Octobermoon also has adjustable straps so finding the perfect fit should not be a problem. Choosing a mask that’s just the right size for your face is crucial. A mask that’s too small will be very uncomfortable to wear for any period of time while one that’s too big will allow water to sip into the mask, which is a major safety issue. In short, the mask needs to fit perfectly. There’s no argue that Octobermoon full-face mask is one of the best snorkeling masks you can find on today’s market. But, is it actually the best choice you can make? Well, it all depends on your preferences. Perhaps going through its pros and cons is going to help you make your decision! As you can see, by comparing the pros and cons of this mask we must conclude that it’s definitely worth buying. And considering that its price does not make it stand out from similar products, we can say that this mask is pretty affordable, so you really have no reason not to get it.